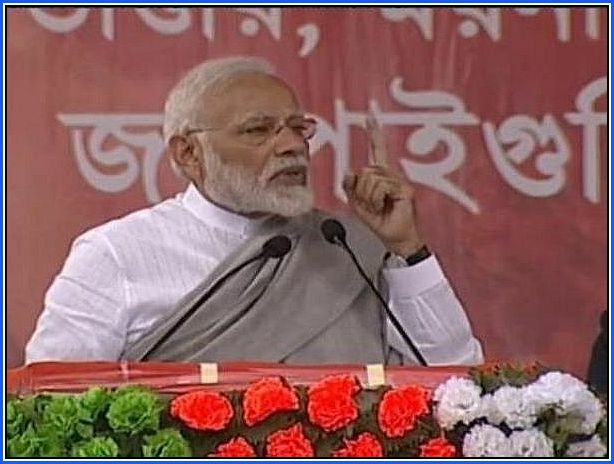 Prime Minister Narendra Modi started his election campaign in Bengal today by addressing a huge gathering in Darjeeling Lok Sabha constituency. As expected, he came down heavily on ruling TMC. But preferred silence on separate Gorkhaland statehood demand that has remained as the most vibrant issue in deciding electoral fate of this constituency for over three decades. BJP workforce in northern half of Bengal arranged a huge gathering at the public meeting field at Kawakhali near Siliguri in Darjeeling constituency. After delivering his speech there, Modi proceeded towards another meeting in southern part of the state at Kolkata. Criticising state ruling party of Bengal TMC and Chief Minister Mamata Banerjee, the PM said, “Didi (Mamata Banerjee) is speedbreaker in the path of West Bengal’s development.” He also said, “Didi's ministers, officials and aides ran away with the money of my poor brother and sisters being involved in Chit fund scam. They have looted the poor people." The PM has strongly criticised WB ‘s pulling out of central Government’s Ayushman Bharat yojana, or Krishan Samman Yojona. But, he did not mention anything specific on Gorkhaland statehood issue in his half an hour long speech. Undoubtedly, that has disappointed his election ally here Gorkha Janamukti Morcha(GJM), the political force of Darjeeling hills that practically stands on this demand only. With over 14 lakh voters, Darjeeling has three assembly constituencies in hills and four from plains. Usually, lion’s share of the voters from hills remains in favour of Gorkhaland statehood and cast vote by the call of GJM. But vote from plains is a usual mix bag. By shaking hand with GJM in 2009 and 2014, BJP was successful in gaining this huge sized block pro Gorkhaland vote bank and thus winning Darjeeling seat with heavy margin. But now, following years long political dynamics initiated by Mamata Banerjee, a major breakaway section of GJM has gone towards TMC dividing the solid block vote bank . Eventually, that has made the constituency uncertain for everyone. Darjeeling is going to have the fight mainly between BJP’s candidate Raju Singh Bista who is supported by GJM, TMC’s Amar Singh Rai, supported by breakaway faction of GJM, CPIM’s senior leader Saman Pathak and INC’s leader Shankar Malakar.